Mega CC Premium Brewery Pub will offer a Big Event with ETRO from Jan. 12 until Feb. 6 (Sundays and Lunar New Year Holidays excluded). With the theme; ‘The Best Meets the Best,' Mega CC Premium Brew Pub will present bags, scarves, hair bands, hair pins and more, from the world-famous house of ETRO, to pairs of tables ordering beer and menu items totalling more than 100,000 won by 9 p.m. everyday during the event period. Mega CC is an entertaining place for people on the go, and for those who enjoy the informality of a Brew Pub environment. Offering a 'mega-ton' of fun and joy for beer-lovers, the ambient appeal of Mega CC can be characterized into five categories; "Mega Space," "Mega Beer," "Mega Dishes," "Mega Service," and "Mega Entertainment." 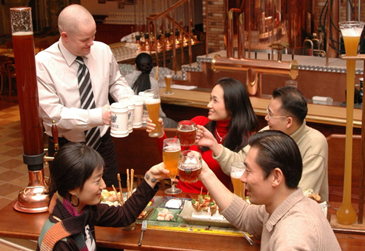 Mega CC targets patrons who pursuit genuine flavor in fun trendy places.